The book provides a comprehensive overview of the European Union and its functioning from a political, economic as well as legal perspective, outlining the EU’s institutions, policies and legal and decision-making mechanisms in simple language. It also contains a glossary of 400 terms, which can serve as a compendium on its own. This book owes much of its success to the fact that it evolves together with the European Union, keeping its readers abreast of the latest changes in Europe’s architecture. One would be hard pressed to find many volumes that follow the EU’s development so closely, with subsequent editions published so frequently. This latest edition presents the post-Lisbon Union as overhauled by the Treaty of Lisbon, discussing the latest policy reforms from Europe’s response to the financial and economic crisis to agricultural policy reforms, from the EU as a global player to a revised European energy policy. As in the case of previous editions, the Handbook gives an exhaustive and up-to-date overview of the Union, making it an essential read for those who want to know more about the EU and how it works. 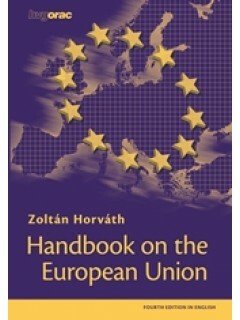 Professor Zoltán Horváth is the author of eight books on the European Union and international organisations. He studied in Hungary, France and the United Kingdom, and wrote his PhD thesis on EU decision-making. He has worked at the University of Economics of Budapest, the Hungarian Academy of Sciences, the Hungarian National Assembly, and the Budapest Management College. In the last few years he has also led on behalf of the EU several capacity building and EU approximation projects in candidate and potential candidate countries. His last book was nominated for the European Book Prize in 2011.